Part of the Medieval Belfry hand crafted ironwork lighting range from Elstead lighting. A suite of Gothic light fittings designed and made in England to the highest standards. 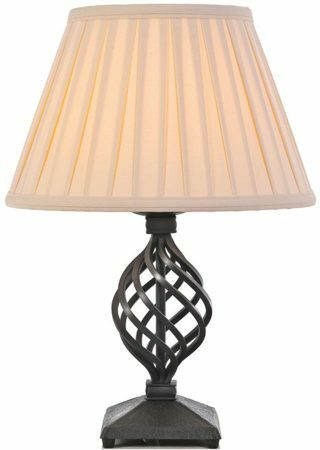 Handmade wrought iron black finish table lamp. A decorative twisted wrought iron stem and a heavy chamfered square base complete the Gothic look. Supplied with an ivory 14-inch box pleated shade shade as shown. Height with shade 435mm, diameter 310mm.